I drank my first glass of Schmoylent this morning. I like the slightly sweet, oaty, slightly vanilla flavor. The fine grittiness present immediately after mixing is mostly gone, replaced by a smoother but still gritty texture. It’s not smooth like a milkshake, but it’s definitely not a problem, at least for me. For what it’s worth I mixed it by hand in a big plastic pitcher using a whisk since I don’t have my Soylent starter kit yet. I let it chill overnight in the fridge and added vegetable oil this morning, followed by another quick whisking. It didn’t separate at all overnight and I didn’t notice any sediment in the bottom of the pitcher before whisking, and there were no clumps or unmixed spots; it looked and tasted homogeneous. My wife had a sip and said it tasted just like pancake batter. It’s too sweet/vanilla to be neutral, but I like the flavor and smell and can see drinking it without getting sick of it, or caring. No gastrointestinal issues so far, and I don’t feel hungry. Great job @axcho! @tomatobasil’s first glass of Schmoylent! Mixing: I didn’t even do a whisk, I just put about 1-2 inches of cold water in the bottom, poured powder on top, then filled to about 2/3 with water, and shook like the dickens. Then filled the rest of the way, shook some more, and put it in the fridge. When I took it out again, I added the oil* and shook shook shook some more. I need to get a more airtight pitcher (with added benefit that I’ll have 2 once my backerkit arrives). I was going to use a stick blender but my roommate’s that he had his parents ship to him is apparently busted, so no dice. We’ll get it fixed or get a new one soon. Texture: It’s gritty, but not unpleasantly so. The level is such that I definitely don’t need to chew but I kinda want to anyway. Maybe that’ll be different when I use the stick blender. Flavor: It’s very sweet and vanilla-y, to the point that if official Soylent is even more so, as axcho says, I could see myself tiring of it, contrary to the “too neutral to get tired of” claims. But–it does taste good. Cake batter is the closest flavor description I can give. I was hoping to try a savory version or two at some point and with this mixture I won’t. But I bet axcho will whip up an order with some different protein and less or no stevia if I ask at some point in the future :) I will try chocolate some day this week, and maybe I’ll blend some frozen berries into one day’s. Cleanup: It leaves a chalky, smooth, clingy film when it dries–on the glass you use, on your hands if some gets there while mixing as it did for me… anywhere. So be ready to rinse or wash everything you use immediately. I just poured tap water into the glass to get any dregs and drank it. It was cloudy, but considerably less objectionable than doing the same thing with milk, for example. One thing of note, I was so craving something crunchy/savory/spicy that I ate a couple of spicy Doritos Fiery Habenero Dinamitas that I had open. So the bad news is that I did cloud the data a tiny bit (I’ll have to specifically resist to get clean data another day this week), but the good news is that just 2 of them** was enough to completely satisfy that craving. Sorry for being long-winded, but congrats if you made it this far. I like to be thorough! **approx. 20 calories, 1g fat, 2g carbohydrate… not very significant next to a whole day’s recipe of soylent, except that they have MSG which can be a migraine trigger for me. I’ve now been on 50-75% Schmoylent for 2 days and it’s looking like that’s going to be my sustainable level. I have more frequent social eating than I realized :) plus craving different textures, and to a lesser degree different flavors, would be a real issue if I were to try to go closer to 90-100%. Some days will be more, some less, but this seems like a good place to be for now. Gas: Quantity either same or less as my standard diet so far. Smell was undetectable to mild, except for a bout of what I can only imagine was the Soylent farts people have been talking about. They were nasty, but they didn’t last long. Hopefully they won’t become a regular thing. It happened a little while after drinking a glass at a faster pace than the others I’d had thus far, so maybe that’s related? Flavor: I didn’t get tired of it to the point that I wanted to stop, but it’s still pretty sweet for my tastes. BUT! I added cocoa powder to a portion of it and WOW! It thickens it of course, so you have to add some more water to compensate, but the flavor is fantastic. The bitterness of the chocolate covers the vanilla and balances the sweetness. I love it! I can still imagine getting tired of it this way too, but not as quickly. Breakfast was the remainder of the chocolate portion and was quite enjoyable. Still looking forward to trying some with other flavors. Peanut butter, some sort of tart berry, maybe some citrus… I’ll have to try them all in small portions in case it’s lousy. Portability: We’ll see. I had a decent size breakfast serving and brought a 1-cup serving to work to be lunch before going out with friends for a semi-healthy dinner in the evening. It won’t have soaked, I’ll be using watercooler water and ice, and I’ll either have to stir or makeshift cover and shake, so I anticipate it being non-ideal but hey, it’s another test of a product :) Eventually I’ll get a working immersion blender and it’ll be easy enough to transport alongside if I need to. One thing worth noting: yesterday late afternoon I was getting hungry. It wasn’t too long before dinner but long enough that I didn’t want to just wait, so that’s when I mixed up the chocolate version. Even despite the great flavor I raved about above, I only had about 1/3 of a glass before I was feeling satisfied, so I put the rest back in the fridge. This might seem like a small thing to most people but to me it was a big deal–because I rarely put things back. I finish all of whatever portion I fix for myself, of anything, unless it’s really terrible. It’s a struggle to force myself to bring half my restaurant portion home in a doggy bag, even when it’s a huge portion that nobody but triathlon runners should probably be eating. This is one of the biggest reasons I wanted to get on soylent in the first place: portion control. But I was perfectly happy putting this great-tasting stuff back in the fridge, knowing it would be there for me later. Awesome! Looks like it’s already serving one of the main purposes I was looking for! I’ll keep adding updates when I have something worth saying. **My vision is only 20/50 (so not that bad) but I have one eye nearsighted and one eye farsighted. Without my glasses I only focus with my right eye and sometimes it’ll cause headaches, even migraines. Edit: Yeah, texture definitely better if you let it sit and the oil doesn’t mix into it as well if you can’t shake it like hell. But even so: it’s drinkable and the flavor is still fine. 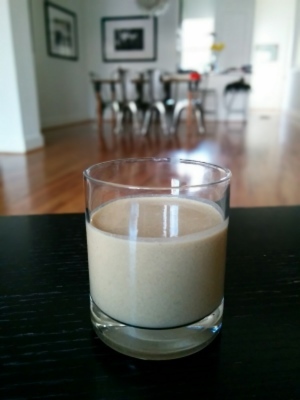 Taste is not quite like Soylent: it’s sweeter and the vanilla taste is… different? It doesn’t read as vanilla to me. This is especially odd given that Schmoylent has, I believe, natural vanilla flavor. Texture is pretty similar, a slight grit or silty feel, though it is a fair bit thicker than official Soylent, even with the same quantity of water. If you’re a fan of a more milkshake-like consistency, you’d be a fan. I’ve only been drinking it this morning, so I can’t really comment on long-term effects, but I’ll be sure to report in over the next days and weeks with updates on gas, poop, and whether it triggers my allergy response like Soylent did. So far, I’m very satisfied. So cool! :) I’m really eager to hear how things go over the next few weeks, so I can be confident that Schmoylent will be a superior long-term solution than Soylent, especially in terms of side effects like gas.